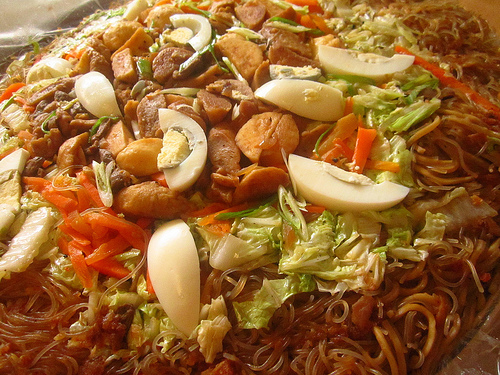 Pancit or pansit is the term for noodles in Filipino cuisine. Noodles were introduced into the Philippines by the Chinese and have since been adopted into local cuisine. Different kinds of noodles can be found in Filipino supermarkets which can then be cooked at home. Noodle dishes are also standard fare in local restaurants. Food establishments specializing in noodles are often referred to as panciterias. 1. If using mushrooms, soak them in warm water for 30 minutes, then cut into strips, discarding the tough stems. 3. Heat oil over medium-high heat in wok or large skillet. 4. Saute garlic and onions until tender. 5. Add pork, chicken and shrimp, and cook until browned. 6. Add soy sauce, stirring to flavor. 7. Add chicken broth and bring to boil. 8. Add cabbage, green beans, carrots and mushrooms. 9. Cook until vegetables are tender, yet crisp, 5-8 minutes. 10. Add noodles, mixing gently to prevent them from breaking. 11. Cook until liquid is absorbed and noodles are done, about 10 minutes. 13. Season with black pepper and patis. 14. Garnish with green onions and lemon wedges. Prepare Palabok Sauce: Strain atsuete then combine atsuete water with shrimp juice in a saucepan. Disperse flour in water then add to the pan. Bring to a boil and cook with constant stirring until thick. Season to taste. Boil water in a pot. Place noodles in a bamboo strainer or luglugan. Dip in the boiling water and cook until tender but firm. Drain well. Transfer to a platter. Top noodles with sauce. Over the sauce, arrange the pork and tokwa pieces. Sprinkle with tinapa and chicharon. Garnish with sliced egg, shrimps, spring onions and garlic. Serve with kalamansi. 2. For the sauce, combine cornstarch solution, oyster sauce, fish sauce, black pepper powder, shrimp broth, sugar and sesame seed oil in a small bowl. Set aside. 3. Heat oil in a wok, brown the chicken meat, then add garlic and onion, stir for 1 minute. 4. Add all the vegetables except sprouts. Season with light sauce and stir fry for a minute. 5. Add the miki and toss several times, pour in the sauce mixture, stir until the sauce is thick. 6. Add the bean sprouts, stir for 30 seconds then off the heat. 7. Garnish with the green onions and slices of hard-boiled eggs. 1. In a bowl, soak sotanghon in water until soft, drain, and cut into 6-inch lengths. 2. In a stockpot, boil chicken, bay leaves, peppercorns, and 1 c onions in water covered for 1 hour or until chicken is tender. Set aside and let cool. 3. Remove all flesh from the chicken. Discard the skin, and cut the meat into thin strips. 4. In a wok, saute garlic and 1/2 c onion in oil until transparent. 5. Add in chicken and mushrooms. 6. Add 3-1/2 c chicken broth, and bring to a boil over high heat. 7. Add in carrots, leeks, and celery. 8. Add sotanghon noodles. Season with salt and pepper to taste. 1/2 lb. Fresh Squid, (cut into 4 ring portions and fry for at least 3 minutes). 1. Soak the noodles in water for ten minutes, then drain. 2. Mix the flour with 1/2 cup of water, and set aside. 4. Fry the pork, on low heat until brown. Add the shrimps and the bean curd and let sit for about 1 minute. 5. Add 1/2 shrimp juices, cover and simmer. 6. Season with salt and pepper, then set aside. 7. Take the remaining 1 1/2 shrimp juice and add to the flour mixture. 8. Let simmer over low heat, stirring constantly. 9. Season with salt and pepper and set aside. 10. Boil 5 cups of water in a large saucepan. 12. Fill the skimmer with a cup of rice noodles at a time. 13. Dip the skimmer into the boiling water for one minute and drain well. 14. Pour the noodles into a large serving platter and spread with the sauce. 15. Top the sauce with the pork, squid and shrimps mixture, then sprinkle with the fried garlic and crushed pork rinds. 16. Garnish with the all the vegetables egg slices, dash of pepper and lemon (to be squeeze). This noodle dish can be serve in any meal, it can be snack, a dinner or if you double the amounts, this can go well in big gatherings. 1. Put all the ingredients (ground pork, onions and 1 tbsp of fish sauce) together in an aluminum bowl. 2. Mix the ingredients thoroughly with the help of a wooden spoon. The mixed ingredients will serve as fillings of the molo wrapper. 3. Put a spoonful of the filling into each piece of molo wrapper. Make as many as 20 pieces of wrapped molo. Set them aside while you prepare the broth for the pansit molo. 4. Heat a little amount of cooking oil in a pan and saute garlic, ginger and onions. Stir the ingredients well. 5. Next, add the remaining filling. Stir ingredients again. 6. Pour one liter of water slowly into the sauteed ingredients. Stir ingredients well and then cover the pan. Let boil for 10 minutes. 7. After 10 minutes, put the wrapped molo one by one into the broth. Do this carefully so that the wrapped molo will not stick together. Season broth with black pepper. 8. Add spring onions and fried garlic to the broth. Stir lightly. Reduce heat once the pieces of wrapped molo are fully immersed into the broth. 1. Preheat a small amount of cooking oil in a frying pan. Saute garlic and onion together until cooked or until garlic turns golden brown. 2. Add pork. Stir ingredients until pork is slightly cooked. 3. Add a shrimps and pork liver. Stir again. 4. Season the sauteed ingredients with right amount of fish sauce to taste. 5. When the pork liver is already cooked, add the rest of the ingredients. Then add the cubed chayote. 6. Add one cup of water until chayote is almost immersed in the water. 7. Cover frying pan and cook sauteed ingredients for 5 minutes or until chayote is well cooked. 8. Add pechay when chayote is already cooked. 9. Cover the frying pan again and cook ingredients for three more minutes or until pechay is slightly cooked. 10. Add pansit miki to the ingredients. Use two wooden ladles to thoroughly mix the ingredients together. Now, the ingredients area ready for wrapping. 11. Prepare banana leaves into funnel-shaped wrappers. Put enough amount of pansit habhab in each piece of the banana leaf wrapper. 12. Fold the allowance of the banana leaf over the mouth of the funnel shaped wrapper to close it. Fasten wrapper with a piece of toothpick so that it will not spill over or untangle. 13. Wrap the rest of the cooked pansit habhab in the same manner above. Malaki ang maitutulong nito sa aming Grupo para sa aming mga Pangkabuhayang Proyekto. Maraming salamat.